I have been working with some children to make the arrival at school much safer. They are so good they have just earned us the GOLD award! 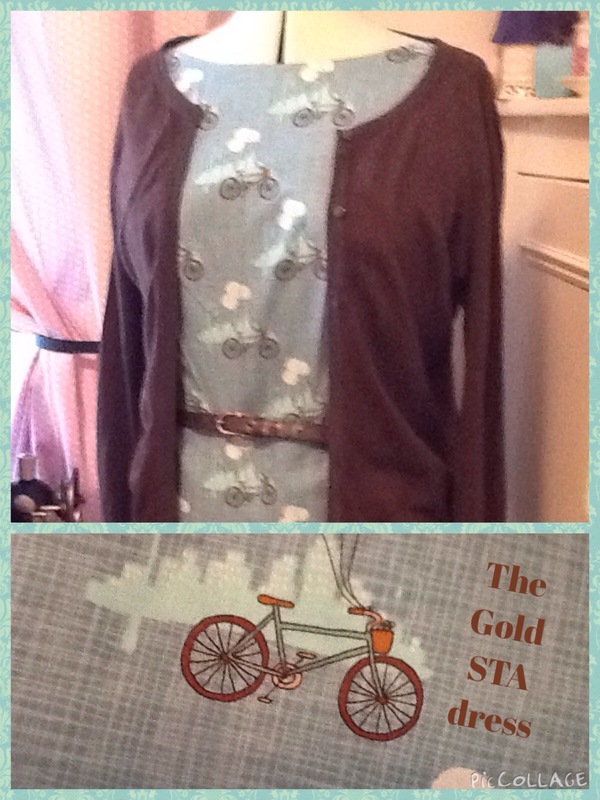 Because the award is all about Sustainable Travel I could not resist making myself a new Ruby Dress (Sew Simple) covered in sustainable travel ie bikes! I managed to find this quilting cotton in the sewing machine shop in town. It was lovely to sew, but I didn’t buy enough for a circle skirt as in the original Ruby dress so I followed the Howe Dress idea and made some pleats. I used bias tape in the neck and sleeves. I also used a strip of interfacing on the neck to add some stability . I used 3 metres of brown bias tape on the hem and one of my new Singer sewing machine’s lovely new decorative stitches. Notions: 5m of bias binding for hem and neck and arm holes. Everyone I work with had such a great laugh at my complete craziness to make a dress for the Event….but if you can…why not????? And some were glad I had not gone for a gold sequinned lamé number!! Makes perfect sense to me! If you have an occasion, make a dress! Haha! It is ! 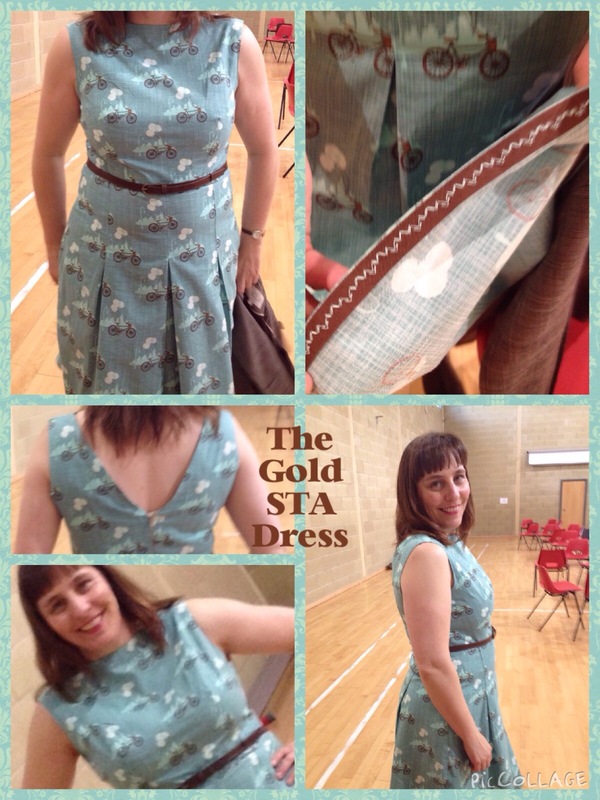 But when you can make a beautiful dress for the price of two lattes who can resist! Haha thanks! Love it! I think you need to make some matching shorts to wear underneath – then you can ride your bike and keep your modesty! Going shopping for clothes must be dull now after making stuff – I can’t imagine buying a frock now, I like to make them especially for an occasion, but need more occasions! Yes, i used to be always buying clothes and not any more. They are just a rip off! Especially all the shift dresses around now. But i am getting better at making for my body shape i think now. The ‘in at the waist and full skirt ‘ seems better for me. And i finally found a dress which fits without altering the oattern! My mission since i started all this! I coul get boring now and just keep making this dress in different outfits! Lol i need more occasions too! LOVE your fabric! Have been doing your trick for summer shift neck & arm bindings, but never thought to iron on a bit of interfacing for some stability. Will remember that for next season. Thanks del! It does work do you think? I much prefer it to facings! Having said that i have another made up which has the facings! Lol! Yes, I do, too. Perhaps because there’s no facing to have to tack/sew down – it’s all by machine. What do you think? Lace which Annice says is perfect for Halloween! ! Haha it is supposed to be to wear to an engagement party! Gotta love a child’s take on a project 🙂 May have to give this pattern a go seeing as you’re getting so much use out of it. Will look forward to seeing the others. I love that bike fabric. Looking great Amanda. I bet the kids loved it. It just goes to show that inspiration can come from the strangest places! I love the colours. They go perfectly with that cardigan. It looks great on you.